"Captain Oates" redirects here. For other uses, see Captain Oats (disambiguation). Captain Lawrence Edward Grace "Titus" Oates (17 March 1880 – 16 March 1912) was a British army officer, and later an Antarctic explorer, who died during the Terra Nova Expedition. Oates, afflicted with gangrene and frostbite, walked from his tent into a blizzard. His death is seen as an act of self-sacrifice when, aware that his ill health was compromising his three companions' chances of survival, he chose certain death. Oates was born in Putney, London in 1880, the son of William and Caroline Oates. His family was wealthy, having had land at Gestingthorpe, Essex, for centuries; his father moved the family there when his children were small after succeeding to the Manor of Over Hall, Gestingthorpe. His sister Lillian, a year older, married the Irish baritone and actor Frederick Ranalow. An uncle was the naturalist and African explorer Frank Oates. Oates lived in Putney from 1885–1891. He was one of the first pupils to attend the nearby Willington School. He went on to Eton College but left after less than two years owing to ill health. He then attended an army "crammer", South Lynn School, Eastbourne. His father died of typhoid fever in Madeira in 1896. In 1898, Oates was commissioned into the 3rd (Militia) Battalion of the West Yorkshire Regiment. He saw active service during the Second Boer War as a junior officer in the 6th (Inniskilling) Dragoons, having been transferred to that cavalry regiment as a second lieutenant in May 1900. He took part in operations in the Transvaal, the Orange River Colony, and Cape Colony. In March 1901 a gunshot wound shattered his left thigh bone, leaving it an inch shorter than the right. Twice called upon to surrender in that engagement, he replied, "We came to fight, not to surrender." He was recommended for the Victoria Cross for his actions and was brought to public attention. He was promoted to lieutenant in 1902, and left Cape Town for England after peace was signed in South Africa. He was mentioned in despatches by Lord Kitchener in his final despatch dated 23 June 1902. He was promoted to captain in 1906, and served in Ireland, Egypt, and India. He was often referred to by the nickname "Titus Oates", after the historical figure. In 1910, he applied to join Robert Falcon Scott's expedition to the South Pole, and was accepted mainly on the strength of his experience with horses and, to a lesser extent, his ability to make a financial contribution of £1,000 (2018 approximation £110,000) towards the expedition. Nicknamed "the soldier" by his fellow expedition members, his role was to look after the nineteen ponies that Scott intended to use for sledge hauling during the initial food depot-laying stage and the first half of the trip to the South Pole. Scott eventually selected him as one of the five-man party who would travel the final distance to the Pole. Oates disagreed with Scott many times on issues of management of the expedition. 'Their natures jarred on one another,' a fellow expedition member recalled. When he first saw the ponies that Scott had brought on the expedition, Oates was horrified at the £5 animals, which he said were too old for the job and 'a wretched load of crocks.' He later said: 'Scott's ignorance about marching with animals is colossal.' He also wrote in his diary "Myself, I dislike Scott intensely and would chuck the whole thing if it were not that we are a British expedition. ...He is not straight, it is himself first, the rest nowhere ..." However, he also wrote that his harsh words were often a product of the hard conditions. Scott, less harshly, called Oates "the cheery old pessimist" and wrote "The Soldier takes a gloomy view of everything, but I've come to see that this is a characteristic of him". Captain Scott, Captain Oates and 14 other members of the expedition set off from their Cape Evans base camp for the South Pole on 1 November 1911. At various pre-determined latitude points during the 895-mile (1,440 km) journey, the support members of the expedition were sent back by Scott in teams until on 4 January 1912, at latitude 87° 32' S, only the five-man polar party of Scott, Edward A. Wilson, Henry R. Bowers, Edgar Evans and Oates remained to walk the last 167 miles (269 km) to the Pole. On 18 January 1912, 79 days after starting their journey, they finally reached the Pole only to discover a tent that Norwegian explorer Roald Amundsen and his four-man team had left behind at their Polheim camp after beating them in the race to be first to the Pole. 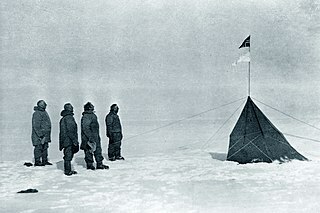 Inside the tent was a note from Amundsen informing them that his party had reached the South Pole on 14 December 1911, beating Scott's party by 35 days. Scott's party faced extremely difficult conditions on the return journey, mainly due to the exceptionally adverse weather, poor food supply, injuries sustained from falls, and the effects of scurvy and frostbite. On 17 February 1912, near the foot of the Beardmore glacier, Edgar Evans died, perhaps from a blow to the head suffered in a fall days earlier. Oates's feet had become severely frostbitten and it has been suggested (but never evidenced) that scurvy had reopened his war wound. He was certainly weakening faster than the others. Scott wrote in his diary on 5 March: "Oates's feet are in a wretched condition ... The poor soldier is very nearly done." Oates's slower progress was causing the party to fall behind schedule. With an average of 65 miles (105 km) between the pre-laid food depots – which each provided a week's food and fuel – they needed to cover 9 miles (14 km) per day to have full rations for the final 400 miles (640 km) across the Ross Ice Shelf. However, 9 miles (14 km) was about their best progress on any day and this had lately reduced to sometimes only 3 miles (4.8 km) due to Oates's worsening condition. On 15 March, Oates told his companions that he could not go on and proposed that they leave him in his sleeping-bag, which they refused to do. He managed a few more miles that day but his condition worsened that night. 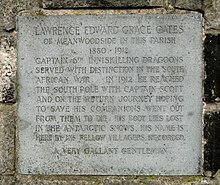 We knew that Oates was walking to his death ... it was the act of a brave man and an English gentleman. On the morning of 16 March (or possibly 15 March – Scott was unsure) Oates walked out of the tent into a −40 °F (−40 °C) blizzard to his death. Scott wrote in his diary: "We knew that poor Oates was walking to his death, but though we tried to dissuade him, we knew it was the act of a brave man and an English gentleman." According to Scott's diary, as Oates left the tent he said, "I am just going outside and may be some time", though Edward Adrian Wilson, who was also present, made no reference to this in his own diary or the letters to Oates's mother. 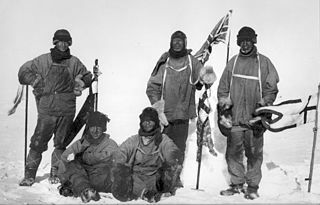 Scott, Wilson and Bowers continued onwards for a further 20 miles (32 km) towards the 'One Ton' food depot that could save them but were halted at latitude 79°40'S by a fierce blizzard on 20 March. Trapped in their tent and too weak and cold to continue, they died nine days later, eleven miles short of their objective. Their frozen bodies were discovered by a search party on 12 November 1912; Oates's body was never found. Near where he was presumed to have died, the search party erected a cairn and cross bearing the inscription; "Hereabouts died a very gallant gentleman, Captain L. E. G. Oates, of the Inniskilling Dragoons. In March 1912, returning from the Pole, he walked willingly to his death in a blizzard, to try and save his comrades, beset by hardships." Oates' act of self-sacrifice is one of the most memorable examples of its kind in recent history, and his understated final words to his colleagues are often cited as a veritable example of the traditional characteristic of British people concerning the "stiff upper lip" attitude. Oates's reindeer-skin sleeping bag was recovered and is now displayed in the museum of the Scott Polar Research Institute in Cambridge with other items from the expedition. The Oates Museum at Gilbert White's House, Selborne, Hampshire focuses on the lives of Lawrence Oates and his uncle Frank. The Royal Dragoon Guards, the successor to the 6th (Inniskilling) Dragoons, have a regimental day to remember Oates. His Queen's South Africa Medal with bars and Polar Medal are held by the regimental museum in York. The then Inniskilling Dragoon Guards was reportedly given £20,000 to help purchase the medals by Sir Jack Hayward. In 1913 his brother officers erected a brass memorial plaque to him in the parish church of St Mary the Virgin in Gestingthorpe, Essex, which his mother, Caroline, faithfully polished weekly for the rest of her life. The church is opposite his family home of Gestingthorpe Hall. In May 1914 a memorial to Oates was placed in the cloister of the newly built School Library at Eton College, itself part of the Boer War Memorial Buildings. It was executed by Kathleen Scott, the widow of the expedition's leader. The Lawrence Oates school in Meanwood, Leeds (closed 1992), was named after him. On the 100th anniversary of his death, a blue plaque was unveiled in his honour at Meanwood Park, Leeds. On 17 March 2007 The Putney Society unveiled a blue plaque at the site of Oates's childhood home of 263 Upper Richmond Road, Putney, London. The current address is 307 Upper Richmond Road. In the 1948 film Scott of the Antarctic, Oates is played by Derek Bond. In the 1985 BBC mini-series dramatisation of Roland Huntford's book Scott and Amundsen, (1979), entitled The Last Place on Earth, Oates was played by Richard Morant. The tragic Antarctic expedition is portrayed in Douglas Stewart's 1941 radio play The Fire on the Snow (first produced 1941, published 1944). A biography by Michael Smith, I am Just Going Outside: Captain Oates – Antarctic Tragedy, (Spellmount Publishers 2002) claimed that a 20-year-old Oates fathered a daughter as the result of a brief affair with an 11-year-old Scots girl named Ettie McKendrick. Brenda Clough's 2001 science fiction novella "May Be Some Time" has Oates transported to the year 2045, where he is healed via advanced medicine. This novella formed the basis for her later novel Revise the World, which also centred on Oates. In Geraldine McCaughrean's 2005 book The White Darkness, a teenage girl, Symone Wates, has an obsession with Captain Titus Oates; she even creates an imaginary friend of him. In Frank Capra's movie Dirigible, depicting an American expedition to the South Pole in the 1930s, a fictional character played by Roscoe Karns incurs injuries similar to those of the real-life Oates, and chooses to sacrifice himself in a manner clearly inspired by the circumstances of Oates's death. The 1985 villanelle "Antarctica" by Derek Mahon details the last moments and sacrifice of Oates. It uses the quotation "I am just going outside and may be some time" as the basis of one of the refrains, and modulates it to "He is just going outside and may be some time". Terry Pratchett uses Captain Oates's last words at least three times in his Discworld Series in similar situations. These include #11, Reaper Man, in which the words "I am just going out. I may be some time" are spoken by Windle Poons; #13, Small Gods, in which the line "I'm just going out. I may be some time" is spoken by Brutha; and #16, Soul Music, in which the line "I may be some time" is spoken by Death. In Tom Stoppard's 1972 play Jumpers, Stoppard describes two fictional British astronauts named "Oates" and "Captain Scott" whose lunar landing craft is damaged when setting down on the moon, such that the rockets appear to have only enough lift to carry one of the astronauts off the surface. Stoppard has Scott and Oates fight to be the one to get back in the landing craft. Scott wins the fight and closes the hatch to the craft with the words "I am going up now. I may be gone for some time." He is a character in Beryl Bainbridge's novel The Birthday Boys (1991) in which Bainbridge writes about the ill-fated expedition from the point of view of Scott and the four men he took to the Pole. In Margaret Atwood's 2009 novel The Year of the Flood the character Adam One makes reference to "Saint Laurence 'Titus' Oates of the Scott Expedition" in a speech made to the followers of the God's Gardeners eco-fanatic religious group. One of the characters is also named after Oates. Spanish heavy metal band WarCry song "Capitán Lawrence" of El Sello De Los Tiempos album tells of his sacrifice to save his comrades. In China Miéville's SF novel Embassytown (2011), several human characters 'take the Oates Road' when they walk out in the alien city that surrounds them, where they hope to die. Oates-like brave polar explorers are also mentioned earlier in the novel when humans trade with the aliens. In the 1991 episode of Red Dwarf, "White Hole", and in Rob Grant's Red Dwarf novel Backwards, Kryten attempts to persuade Rimmer to make a sacrifice (specifically, turning himself off so that the power-deprived ship will have more energy) in the manner of the brave Captain Oates, to which Rimmer replies, "How do we know that Oates went out for this legendary walk? From the only surviving document: Scott's diary. And he's hardly likely to have written down, "February the First, bludgeoned Oates to death while he slept, then scoffed him along with the last packet of instant mash." How's that going to look when he gets rescued, eh? No, much better to say, "Oates made the supreme sacrifice", while you're dabbing up his gravy with the last piece of crusty bread." Rimmer concludes, "If that'd been me, I'd've stayed in the tent, whacked Scott over the head with a frozen husky, and then eaten him." The Lee and Herring series Fist of Fun featured a recurring sketch which portrayed Oates' sacrifice not as heroism, but as an act of passive-aggression. This behaviour would continue in other situations, such as Oates at a dinner party (in full Antarctic expedition gear) refusing the last roast potato in a way obviously designed to elicit sympathy. In the original version of the 1999 Robbie the Reindeer cartoon Hooves of Fire, Robbie quotes Oates's last words when telling Blitzen that he's leaving Santa's sleigh team. In the American dub of the special, the line is changed. In the song "Héroes de la Antártida" by the Spanish pop group Mecano on their album Descanso Dominical. Australian post-rock band We Lost the Sea song "A Gallant Gentleman" on their album Departure Songs pays homage to Oates's sacrifice. In the third episode of the seventh series of Peep Show, Mark likens Jeremy's expedition to read Wuthering Heights on their balcony to Oates's death. "There goes the Captain Oates of having to read a relatively short book." ^ "Online Reader – Project Gutenberg". Gutenberg.org. Retrieved 8 October 2011. ^ "Surrey - Godalming, Charterhouse School - World War 2". Roll of Honour. Retrieved 27 April 2017. ^ a b "How the last words of Titus Oates still inspire his regiment". BBC News. 9 July 2012. ^ "The Army in South Africa - Troops returning home". The Times (36790). London. 10 June 1902. p. 14. ^ "No. 27459". The London Gazette. 29 July 1902. pp. 4835–4838. ^ Huntford, Roland (1984). Scott and Amundsen. Atheneum. p. 345. ISBN 978-0-6897-0-656-1. ^ "Historic inflation calculator: how value of money changed since 1900". This is Money. Retrieved 24 October 2018. ^ Dhruti Shah (10 March 2012). "Antarctic mission: Who was Captain Lawrence Oates?". BBC news. Retrieved 10 March 2012. ^ Shadows of death - Time-Life Books. Books.google.com. Retrieved 27 April 2017. 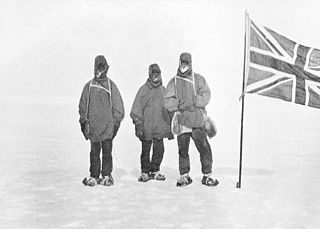 ^ a b "British history in depth: The Race to the South Pole". BBC. 3 March 2011. We knew that Oates was walking to his death... it was the act of a brave man and an English gentleman. ^ Scott, Captain R.F. Scott's Last Expedition: The Journals of Captain R.F. Scott. Pan Books, 2003, p.462. ^ Paul Simpson-Housley (1992) Antarctica: exploration, perception, and metaphor p. 36. Routledge, 1992. "I am just going outside and may be some time." ^ Roland Huntford (1979) Scott and Amundsen: The last place on Earth p. 523 "Wilson was writing a very personal letter and, if Oates had expressed heroic intent, he would have told Mrs Oates so, including presumably his last words"
^ Robert Falcon Scott (12 October 2006). Journals : Captain Scott's Last Expedition: Captain Scott's Last Expedition. Books.google.com. p. 454. Retrieved 27 April 2017. ^ "Home". Gilbert Whites House. 20 June 2014. Retrieved 27 April 2017. ^ Asquith, Stuart. Regiment Issue 34. Nexus Special Interests,1999, p. 15. ^ ""Polar medal now in regimental museum" ''The Evening Press'' 13 September 1999". Archive.thisisyork.co.uk. Retrieved 8 October 2011. ^ "Colourful life of a British eccentric". Shropshire Star. 14 January 2015. Comment and Analysis article on Sir Jack Hayward by Mark Andrews, which misnumbers the regiment as the "5th". ^ "Plaque to mark South Pole explorer Captain Oates - BBC News". Bbc.co.uk. Retrieved 27 April 2017. ^ "Blue Plaques Scheme" (PDF). The Putney Society. Retrieved 3 January 2018. ^ "The Last Place on Earth". IMDb.com. Retrieved 27 April 2017. ^ John Ezard (14 October 2002). "Antarctic hero Oates 'fathered child with girl of 12'". London: The Guardian. Retrieved 8 October 2011. ^ "Antarctic legend's secret scandal". BBC News. 14 October 2002. Retrieved 7 August 2008. ^ Pratchett, Terry (1991). "Reaper Man". TVTropes. Retrieved 24 December 2016. ^ Pratchett, Terry (1992). "Small Gods (Discworld #13)(38) by Terry Pratchett". Gollancz. Retrieved 24 December 2016. ^ Pratchett, Terry (1994). "Soul Music (Discworld #16)(3) by Terry Pratchett". Gollancz. Retrieved 24 December 2016. ^ Purse, Nigel (2016). Tom Stoppard's Plays: Patterns of Plenitude and Parsimony. Leiden: Brill. p. 155. ISBN 9789004318366. The significance of the moon landing for interweaving the vehicle of the play into the ideas it discusses is two-fold. First of all, 'Millions of viewers saw the two astronauts struggling at the foot of the ladder until Oates was knocked to the ground by his commanding officer... Captain Scott has maintained radio silence since pulling up the ladder and closing the hatch with the remark, 'I am going up now. I may be gone for some time.' Apart from being an inverse pun on the famous scene on Scott's Antarctic journey in which Oates sacrifices himself with the words, 'I am just going outside and may be some time', it demonstrates the chaotic world of relativism in which the morality of one's actions depends upon one's point of view. ^ "White Hole". IMDb.com. Retrieved 6 August 2016. ^ "We Lost The Sea – Departure Songs, an Analysis Of". Retrieved 6 June 2017. Goldsmith, Jeremy: British Army officers' records; Career Soldiers in the Family Tree Magazine (London) of June 2007, which shows Oates's Record of Service (with a birth date of 16 March 1880).